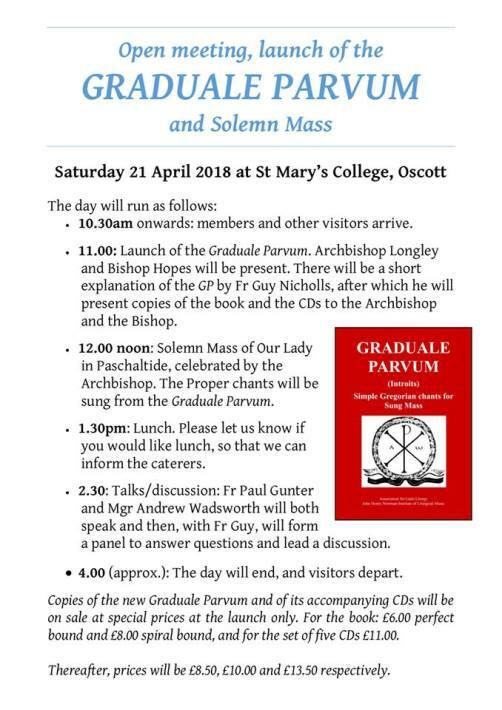 The Introits of the Graduale Parvum, a new work to support the use of Gregorian chant in parish churches, will be launched at St Mary’s College, Oscott, in Birmingham, England, on Saturday, April 21, at 11 a.m. See the poster below for the full schedule events for the launch, which includes a solemn Mass celebrated with the chants from this book. The Graduale Parvum is a collection of Gregorian chant Propers for every Sunday and Holy Day in both Latin and English. It is wholly authentic – it uses the same modes as the Graduale Romanum and follows its texts precisely – but simple to sing, and well within the capability of choirs of any parish church. This launch of the Introits will be followed in stages by the other chants of the Propers. The work has been compiled and set by Fr Guy Nicholls, the Director of the John Henry Newman Institute of Liturgical Music, in conjunction with the Association for Latin Liturgy. For further information, or to attend the launch at Oscott, please email: enquiries@latin-liturgy.org. or call 0117 962 3558.